These Valentine’s Day confections are all conveniently located at Amazon and ship free with Amazon Prime. Not yet a Prime member? No worries! You can sign up for a free 30-day trial HERE. 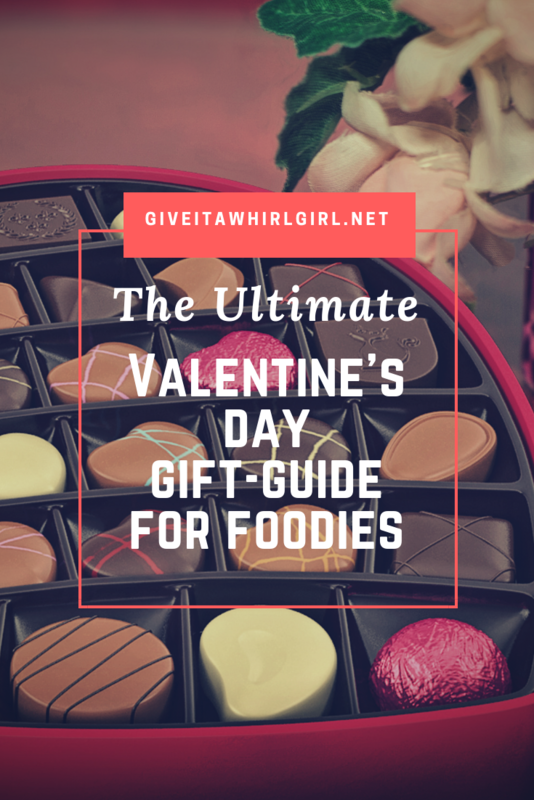 And now onto this year’s 2019 Valentine’s Day Gift Guide For Foodies! Let’s kick things off here with this Valentine’s gift-guide and share with you one of my favorite brands of chocolate confections- Chauo! Chauo comes up with some pretty creative flavors of chocolate bars and this gift-set of mini chocolate bars is perfect for gift-giving! Flavors included in this Chuao Chocolatier Taste the Joy Gift Set includes: Firecracker, Honeycomb, Sprinkle Dreams, Salted Chocolate Crunch, Baconluxious, Spicy Maya, Cinnamon Cereal Smooch, and Potato Chip. Oh man, oh man! These chocolate covered strawberries right over here by Golden State Fruit are my true weakness right here! These are similar to Shari’s Berries, which I have had before. Chocolate covered strawberries are the perfect way to a woman’s heart! This Valentine’s Day gift set includes strawberries dipped in milk chocolate, dark chocolate, and pink-tinted white chocolate. If you know me well then you would know that I am always all about giving new and exciting flavors a whirl! This gourmet gummy-beat variety pack from Project 7 delivers with some unique flavors of cocktails. These gummies are non-alcoholic but are flavored like a Moscow Mule, champagne, a Manhattan, and an Old Fashioned drink. This gourmet chocolate gift-set from Godiva Chocolate includes a little bit of everything. This Valentine’s Day gift box includes milk chocolate, dark chocolate, and white chocolate. Do you have an Oreo lover in your life? I sure do! My hubby could kill an entire bag of Oreos in one sitting, I am sure of that! My husband, Joe, has a serious Oreo addiction and I know in my heart that this Oh! Nuts gift-set of chocolate covered Oreos would give him pure bliss! This gift box contains an assortment of 20 different chocolate coated Oreo sandwich cookies. Ah yes… fruit and nuts is always a winning combo for me and this is a tad bit more on the healthy side of things. This fruit and nuts gift set from Five Star Gift Baskets contains a variety of dried fruits and nuts. Wondering what is inside? Each Valentine’s Day gift set includes the following items Roasted Salted Pistachios Almonds, Papaya, Pineapple, Californian sun-dried Angelina Plumbs, Kiwi, Hot Cajun Mix & Sugar-Glazed Peanuts! I hail from Michigan and Michigan is well known for their cherry products. Also, no Valentine’s Day gift guide is complete without some sort of chocolate cherry! These chocolate covered cherries from Cherry Republic include cherries from Michigan. You can order a 1lb bag of a 1/2lb bag. Cherry Republic also has cherries available that are covered in dark chocolateÂ , white chocolate, and milk chocolate. I am a huge fan of candy-coated popcorn and this Zebra Popcorn from Popcornopolis does not disappoint! This Zebra Popcorn is white and dark chocolate coated a caramel flavored popcorn. Just imagine for a moment the explosion of flavor that you will get from this! This Barnetts Biscotti Cookies gift set is perfect for the coffee lover in your life. Nothing beats a delicious biscotti cookie dipped in a warm cup of coffee in the morning. There are 20 chocolate covered biscotti cookies in this gift set and they come in six different decadent flavors. Wondering what flavors Jelly Belly threw into their Valentine’s Day mix? Here we have bubble gum, coconut, cotton candy, strawberry cheesecake, and very cherry. This is the most perfect mix of Jelly Belly flavors for your sweetheart! Question Time! Who are you shopping for this year for Valentine’s Day? What item(s) from this Valentine’s Day Gift Guide will you be ordering for your loved one? Leave me a comment and let me know what appealed to you! This entry was posted in Friday Faves, Shopping Guide and tagged amazon, biscotti, chocolate, chuao, cookie, dark chocolate, gift guide, Godiva, gum, gummies, gummy bears, holiday, jelly beans, Jelly Belly, milk chocolate, Oh! Nuts, Oreo, Project 7, shopping, shopping guide, Valentine's Day, white chocolate. Bookmark the permalink. All of these choices would make my heart feel a little more loved on Valentine’s Day. Food gifts are such a perfect addition to Valentine’s Day. I give Valentine’s Day cookie mixes to my kids’ teachers and our neighbors. We also love to make my husband a food themed gift. One year we tried chocolate covered bacon. It was strangely quite delicious. Thanks for sharing these ideas! Chocolate covered bacon! Yes girl! I am going to try making my own someday. Sounds excellent! What fun items. You really can’t go wrong with food as a gift, at least not when it’s going to me. 😉 I’d love some chocolate covered strawberries. Those strawberries sure do look spectacular! Thanks for these yummy ideas. I know my husband would love all of the above. These are perfect to give to a best friend or coworker as well. Thanks for sharing! I’m super hungry now! There look yummy. Great ideas! I am pretty hungry myself! Lol! Love these ideas! The chocolate covered cookies look amazing. I might have to leave some not-so-subtle hints for my hubby! Oh, and maybe find something for him too haha! I know I would be absolutely delighted to have them cookies! Fun round up posts of gift ideas. I do love Zebra Popcorn. It’s delicious. You’ve got lots of great ideas! I have never had Zebra Popcorn but I really really really want to give it a whirl soon! These look so yummy! I am totally going to snag a few of these for my husband. That choclate tasting kit looks delightful. Something new to me. Chauo! Chocolates with bacon no less. Gotta try. And love my jelly beans! Awesome! I am sure your hubby will love it! Chuao does make some excellent chocolate. They have a smores bar and a rocky road bar. They are a couple of my favorites! Everything on this gift guide looks delicious! I’m a sucker for any kind of chocolate. The chocolate covered strawberries and chocolate covered cookies appealed to me the most. Yummy! I’m a sucker for all things chocolate. We are pretty low key on V day – but I do like to pick up beautifully homemade truffles from a local shop. They are to die for. I always need to give my husband hints though so I think i’ll open this page on his laptop!! These are great gift ideas and they all look yummy! I’d like those chocolate covered strawberries, oh my weakness ha. I’m just saying, I’d happily take any of these for Valentine’s Day! My husband and I decided not to exchange anything this year, but I will get something for my kids. And probably my dogs. I’d be happy to get any of these gifts on Valentine’s Day, but chocolate covered strawberries are definitely my favorite V-Day treat! These are all great gifts! I’m a sucker for chocolate and chocolate covered strawberries. My husband and I are going out of town so we will be celebrating VDay on the road.